With Father’s Day this weekend I thought I would come up with a side dish to go with that big juicy steak I know we will be grilling. If you’ve been reading our blog for any time at all, you know my family loves corn. 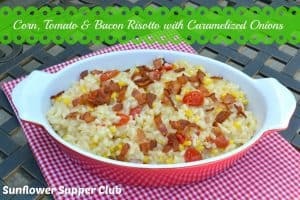 I used my basic Risotto recipe, added corn and sliced tomatoes. The caramelized onions add a sweetness and make this special. Of course, topping all this creamy goodness is bacon for the man we are celebrating this weekend! Melt 3 tablespoons butter in a large skillet over medium heat. Add the sliced onions and saute for a few minutes until soft. Reduce the heat to low and sprinkle the onions with the sugar. Continue cooking the onions for about 25 until lightly browned and caramelized. Add the corn to the onions and cook for a couple more minutes. Remove the skillet from the heat and set aside. While the onions are cooking heat a large heavy pot over medium heat. I use my Dutch Oven. Add the bacon pieces and cook until crisp. Remove the bacon with a slotted spoon and set aside. Pour off all but 2 tablespoons of the bacon grease. Add the Arborio rice and garlic. Saute for about 3 minutes until rice is opaque. Add the white wine and simmer until the wine is almost absorbed. Using a ladle, pour in hot stock ½ cup at a time, stirring frequently. Wait until liquid is almost absorbed before adding more. Adjust the heat accordingly to maintain a gentle simmer. Continue cooking and stirring rice, adding the hot stock ½ cup at a time. This will take about 30-35 minutes. 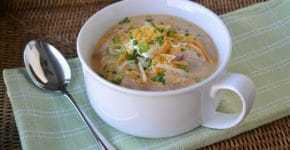 When you add the last ½ cup of broth, add the caramelized onions, corn and sliced tomatoes. Continue cooking until broth is absorbed. Remove from the heat and stir in the remaining 3 tablespoons butter and the Parmesan cheese Add any additional salt & pepper to taste.